The offensive fireworks continued for Ole Miss on Saturday. Since quarterback Jordan Ta’amu took over the helm of the Rebel offense, Ole Miss has had no shortage of success. Except for a late-game meltdown against Arkansas, the already dangerous Ole Miss offense has taken large strides with the Hawaii native under center. Ta’amu continued his dominating style of play Saturday as the Rebels routed the Louisiana-Lafayette Ragin’ Cajuns 50-22. In his three starts at quarterback, Ta’amu has thrown seven touchdowns and rushed for four, with just two interceptions. As a junior college transfer, the game against Arkansas was Ta’amu’s first SEC start. Though Ole Miss lost the game in the final seconds, the Rebel quarterback has seen himself progress since that day. Ta’amu’s confidence showed in excess Saturday as he threw for 418 yards and had five total touchdowns. Two of Ta’amu’s three passing touchdowns went to wide receiver A.J. Brown, who tied Laquon Treadwell’s school record for most receptions in a game — 14. Brown’s 14 catches gave him 185 yards, the second most he has accumulated in a game this season. For Brown, the formula for his success against Louisiana was simple. Although Brown is known to beat defenders one on one, defenses still place him in one-on-one man coverage. For Brown, however, this does not come as a surprise. “I’m not surprised because we’ve got talent outside of us: D.K. (Metcalf) and (Damarkus) Lodge,” Brown said. Offensive coordinator Phil Longo was also pleased with the performance of his offense that came after last week’s win over Kentucky. Ole Miss will have to continue its offensive momentum in its last two games of the season. The Rebels host Texas A&M this Saturday for senior recognition before traveling to Mississippi State to finish the year with the Egg Bowl. If Texas A&M and Mississippi State can run the football with the success they have had most of the season, the struggling Rebel defense may have difficulties getting stops, but the offense should flourish. 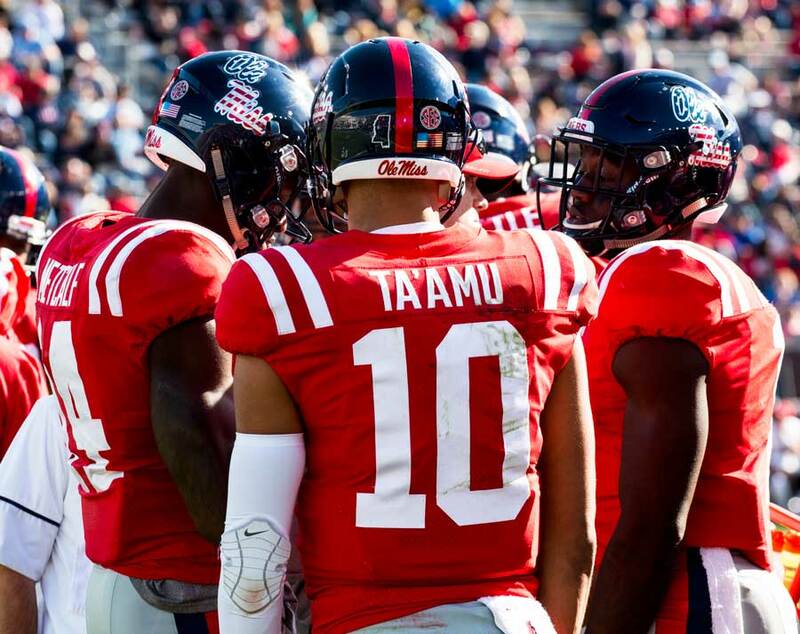 Ole Miss’ offense is good enough to score points against both the Aggies and the Bulldogs, and if the Rebel defense can force enough stops, Ta’amu and company can win more football games. This offense is special — that’s no question. But is it special enough to continue its success?